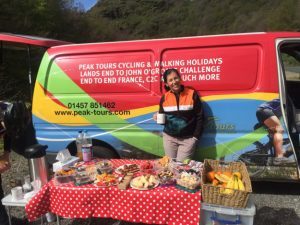 We have a number of different cycle tours tours in France providing tours for different abilities. We have our week long tour in Provence which provides a number of different route options so that you can cycle more or less each day depending on your ability/mood. Our week long tour in the French Alps is a more challenging tour which covers many of the well know climbs of the tour de France. Our Channel to the Med tour is similar in terms of difficulty to our Lands End to John o'Groats tour and can be done in 14 days or for the cyclist who wants even more of a challenge then the tour can also be covered in 10 days. Our friendly, informative and knowledgeable guides will be on hand to help with any requests you may have, day or night. Our legendary “magic van” will be gleaming like a beacon on the horizon (usually at the top of a hill! ), ready to serve you with hot and cold drinks and all manner of refreshments. Your luggage will be transported for you to your accommodation, and all your lunches and snacks taken care of. All you need to think about is pedalling, enjoying the scenery, having a laugh with like-minded people and what you will have to eat in the evening! If you are unsure of what to do with your bike, if you can get it to Glossop in Derbyshire we will happily take it and bring it back for you free of charge. We also stop off a couple of times en-route to the start point so can meet you at a service station off the motorway providing it is on our route down. We can also drop your bike off on the way back using the same method or alternatively we can arrange for your bike to be boxed and couriered to you.